Charles Dickens From a Christmas Carol. 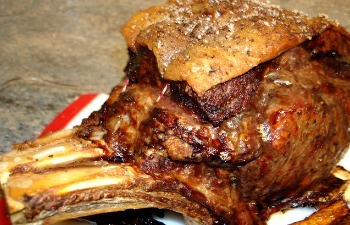 Recipe Of The Month: "Rib Roast." It’s been quite a year here in England we’ve had droughts, floods, cold wet summer and a mild winter. But for me it has still been lovely, what with The Queens Jubilee and London 2012 for the Olympics which were brilliant fun, I have never watched so much sport at once! It will soon be time to wrap up the year and begin a new one, but first lets enjoy Christmas. One of the things I like the most about Christmas is visiting cities to go shopping, it may be a little mad and chaotic but the decorations and Christmas music always makes me smile. I am enjoying being in Exeter for the holiday season which started on the 22nd November for the Guildhall Christmas Lights Switch On which had to be postponed until the next day due to the downpour and floods the South West were having. The capital of Devon does not disappoint when it comes to good food and at the start of December a feast of yummy delights become available. Here is a selection of some of the things I love. Well known for great food Magdalen Road shops have it all for the foodie with the deli ‘Bon Gout’ which has the most wonderful cheeses, cakes, bread and too many other treats to list here, the butchers Pipers Farm which was the BBC’s food producer of the year in 2007 and the fishmongers Gibson’s Plaice which won Devon’s Fishmonger of the year and there are other shops to tempt you. It really is a treat to discover this road lined with small independent shops so you can imagine my delight when I heard about the Magdalen Road Village Christmas Fair. It begins early in the afternoon (this year it was on the 2nd of December 2-6pm) the stalls were bursting with edible delicacies selling everything from cup cakes to Caribbean Goat curry. Local artisans were also selling home made, unique crafts. On the Cathedral Green. 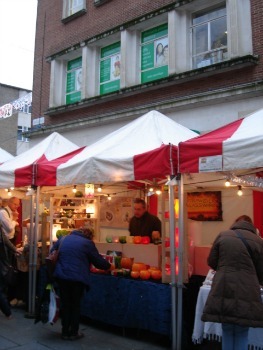 This was the first year of the Christmas Market ( November 23rd to December 16th) with stalls offering unique, handmade and unusual gifts, decorations and more food to tempt me ;) I worked my way through several warm coconut macaroons, they were incredible. Exeter Castle was the host of this years Christmas Craft Jam with over 60 stalls displaying handmade designs, there was also entertainment and craft workshops to enjoy. South West Christmas Without Cruelty Fayre at the Exeter Corn Exchange is on the 24th December and is the Nations fastest growing cruelty free and eco-friendly festival may have just the gifts you are looking for they will have music and food is available in the restaurant. www.Vintagerose.co.uk …”Hand made accessories for you and your cottage” Devon alpaca wool goes into many of her creations. 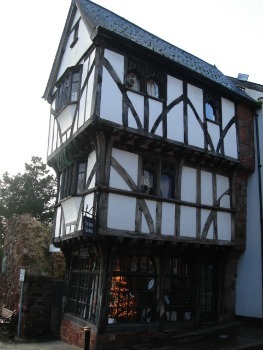 Exeter is a great city to visit at any time of the year, but it is a little bit special at Christmas. Photo: Exeter Christmas Market stall with Glowpot Strawsilk Art by Tim Lee. Need to see last years Christmas issue? If you have a moment and want to relax with a beverage make yourself one of my favourites...a "Devon Velvet"...It's so good! I spent a year in Dartmouth in a cottage with a view of the river Dart. It’s a lovely place to live and to visit, if you would like to do a little armchair travelling over Christmas why not go to Dartmouth? In the U.S.A it’s known as Prime Rib. 3k Rib Roast (approximately 3 ribs) my butcher (pipers farm) prepared mine for me. Bring out the Rib roast several hours before you want to cook it to warm it up, keep it wrapped on the counter, I turn my beef over so it sits on both sides for equal time. When you are ready to begin cooking the meat, heat up the oven to a hot temperature. Season the rib roast with good salt (eg: Cornish sea salt) and freshly ground pepper. Your butcher should have left the fat layer on top, this will help baste the meat while it cooks. Keeping the meat on the bone will add to the flavour and help protect it from over cooking. Prepare and insert thermometer into the middle of the ribs. With a special cut of meat like this, which you really don’t want to overcook as its best served rare or medium rare (unless you prefer medium or well done meat) it’s a good idea to use a thermometer. Place ribs into a roasting pan. When the ovens hot place the roasting pan into the oven, roast the ribs for about 15 minutes to brown, it may take longer with a bigger cut. When the ribs are brown and the fat is bubbling and turning golden turn down your oven to about 180 degrees/160 degrees with a fan oven, if your using an aga/range put into your lowest heat oven (approx 170-180 degrees). Time your ribs or simply watch the thermometer until it gets to your desired temperature. I cooked my rib roast to 49 degrees (60 degrees is recommended for rare) when the meat reached 49 degrees I removed the ribs from the oven and the roasting pan and put onto a carving board and then tented it with foil. Leave in the thermometer and let it rest for at least 20 minutes. The meat temperature will continue to rise when you take it out of the oven. My rib roast went up to 61 degrees and only then did the temperature begin to fall but just to 59 degrees before serving. It took about 30 minutes of resting before I carved it. This gave the rib roast a beautiful roasted outside with tender red meat (not raw or bloody) in the middle and the meat fell off the bone. To make the gravy or ‘jus’ (more liquid than gravy) heat up your good quality beef stock and add a few tablespoons of drippings from the roasting pan (taste the stock and add as you like) simmer and reduce to your desired consistency. I like mine to be more of a jus than a gravy because the next day I’ll have a rib roast and horseradish sandwich dipped into the jus. It’s so good.